The United States has welcomed a report that Iran's largest commercial lender, Bank Melli, has seen its German branch disconnected from phone and internet service under pressure of U.S. sanctions. 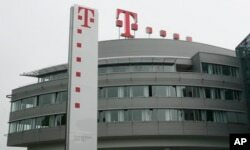 In a Thursday report, German business newspaper Handelsblatt said Germany's part state-owned telecom provider Deutsche Telekom had cut off Bank Melli's Hamburg office. It was not clear when the branch lost its phone and internet services. Handelsblatt quoted Deutsche Telekom as sending Bank Melli a message, saying: "We have to assume that you can no longer make any payments" for telecom services. There was no immediate response from Deutsche Telekom to a VOA Persian request for comment on the move. Bank Melli is among dozens of Iranian banks subjected to U.S. sanctions reimposed by the Trump administration Nov. 5 to isolate Iran's financial sector and pressure Tehran to end perceived malign behaviors. U.S. President Donald Trump withdrew in May from a 2015 deal in which his predecessor and five other world powers granted Iran sanctions relief in return for a freeze on its sensitive nuclear activities. In a Friday tweet, the U.S. Embassy in Berlin posted a link to the Handelsblatt article about Bank Melli, which the embassy accused of funneling cash to Iran-backed terrorist groups. Tehran calls itself a victim rather than a perpetrator of terrorism. The U.S. Embassy in Berlin added two hashtags to the tweet, saying "sanctions are working" and "thank you Deutsche Telekom." U.S. Ambassador to Germany Richard Grenell retweeted the post on his personal account. Iranian state media had no reaction on Friday to the reported cutoff of telecom services to Bank Melli's German branch. Bank Melli Hamburg managing director Helmut Gottlieb told Handelsblatt that the move has left the branch "almost paralyzed." Germany and other EU nations that remain a party to the 2015 Iran nuclear deal have criticized the reimposition of U.S. sanctions and said they will try to shield European companies from the measures. But Handelsblatt quoted German business sources as saying numerous German companies have been filing weekly reports to the U.S. Embassy in Berlin to show that they are abiding by the U.S. sanctions. Washington has warned international companies that they must choose between doing business with Iran and maintaining access to the U.S. market. The company headquarters of Deutsche Telekom AG is pictured in Bonn, Germany, May 30, 2008. The Handelsblatt article did not quote Deutsche Telekom as explicitly citing U.S. sanctions as the reason for the cutoff of services to Bank Melli. An earlier Handelsblatt report published Oct. 2 quoted the German central bank as saying it cannot force German institutions to accept payments from an Iranian bank. The article also said officials of Germany's economics and finance ministries declined to express a position on the issue.